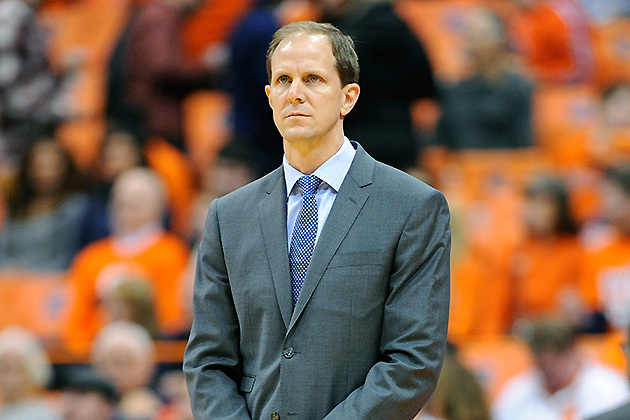 Mike Hopkins is the right fit to be Syracuse's next coach when Jim Boeheim retires following the 2017 season. On Thursday, Syracuse formalized what long appeared the inevitable solution to forging ahead in the post-Jim Boeheim years: It named assistant Mike Hopkins as the replacement for his boss in 2018, giving Hopkins the title “head coach-designate,” which presumably authorizes him to run a program and also sign for Boeheim’s deliveries. It is at once a very easy and very convoluted call. Hopkins is a popular former player, and possessive Syracuse fans turned feral at any suggestion he might work elsewhere. And yet he is the top deputy in a program recently bludgeoned by NCAA sanctions, which is part of the reason Boeheim will retire, which is the entire reason for this announcement in the first place. There’s a bit of nerve in this, really. But that doesn’t necessarily make it inadvisable or inappropriate. Hopkins has been by Boeheim’s side for nearly two decades. He was touched by the scandal that resulted in stinging scholarship reductions, vacated wins and a failure-to-control charge in March, just like everyone else attached to the program. Yet Hopkins also happens to be the best candidate to fix the program and ensure that it hums along after the man who built it leaves. Winning at Syracuse probably isn’t as automatic as it has been under Boeheim. Convincing top-flight recruits to trudge through walls of snow isn’t as simple as the Boeheim regime made it seem. You have to know the place, and you have to believe in every frosted-over idiosyncrasy, because you have to infuse that belief into players who can help you win. No one can match Mike Hopkins in selling Syracuse. And that’s before considering the best tactical path to take here, to finding the coach best fit to carry forward with that matchup zone, which is woven into the program’s fabric. In a team stripped down by those scholarship reductions, identifying the right recruits and then developing them is crucial. Syracuse can’t afford to miss on prospects now and no one is equipped to be more consistently right than Hopkins. Even if another coach were so equipped, he would face an oppressive dynamic that Hopkins likely will not: Getting compared, at every turn, to Jim Boeheim. For Hopkins, the adoration and trust of Syracuse fans seems to run so deep that he won’t face the usual perils of following a legend. He’s been there, as a player or coach, for all but two years since 1989. He is known. He is valued. He is an extension of Boeheim but, in another nod to the crazy dynamics at play here, he is somehow considered his own man—by the masses that fill the Carrier Dome, anyway. Those masses would suffocate anyone else with the specter of Boeheim. They’ll happily free Hopkins of that burden, because they are satisfied with him already. It’s no small victory, registered three years before Hopkins calls his first play from the first chair. Whether Syracuse evades the NCAA Infractions Committee tripwire again requires a character judgment of Hopkins that we’ll sidestep here. Again, he’s a longtime top assistant in a program slammed with serious sanctions three months ago. Maybe he had nothing to do with it; his name didn’t appear anywhere in the NCAA’s crosshairs. It’s nevertheless foolish to assume anything about a coach’s moral compass, either way, especially when every coach is under extreme duress to win. But what can be said is that Hopkins knows the dark corners of Syracuse’s programs and can, if he chooses, avoid the pitfalls that lead to future NCAA investigations. Hopkins has all the information and experience he needs to avoid making the same mistakes, and to insulate the program against future malfeasance. Will he? He seems like a good guy, a decent guy. But only time and a clean rap sheet will tell. In all, it is perhaps the opportunity Mike Hopkins deserves, under any circumstances. If he has been an upright representative of Syracuse basketball all the way, a sharp basketball mind with a great personality and a squeaky-clean approach, then there could be no better choice. There is of course a much more cynical way to look at it—that this is a promotion from within at a place with some rot in the walls. But Hopkins can help fix his alma mater. In succeeding the man who made Syracuse what it is, he can build something just as remarkable in its own way. Starting in 2018, he has his chance at last. Now it’s our turn to wait, to see what Mike Hopkins does with it.